The Houston Texans were coming off three straight wins and, while not in playoff contention, looking to achieve the first winning season in franchise history as they hosted the Tennessee Titans on December 14, 2008. In their third season under Head Coach Gary Kubiak, the Texans had a productive offense directed by QB Matt Schaub (when healthy), who had an outstanding target in WR Andre Johnson (pictured at right), plus rookie RB Steve Slaton to bolster the ground game. The defense, however, was less proficient and streaky Houston had a 6-7 record. The Titans, coached by Jeff Fisher, were 12-1 and had already clinched the AFC South, but were still looking to gain home field advantage throughout the playoffs. Third-year QB Vince Young had been benched in favor of veteran Kerry Collins, to good effect, and rookie RB Chris Johnson was exceeding expectations. The defensive line was anchored by star DT Albert Haynesworth and there were other fine players in LB Keith Bulluck, CB Cortland Finnegan, SS Chris Hope, and FS Michael Griffin. Rob Bironas also provided reliable placekicking. There were 70,831 fans present at Houston’s Reliant Stadium. The Titans had the first possession and moved into Houston territory largely on the strength of Chris Johnson’s running as he gained 29 yards on three carries. But after reaching the 37, Kerry Collins threw a long pass that was intercepted by CB Fred Bennett in the end zone and returned 23 yards. However, after Matt Schaub passed to Andre Johnson for 15 yards, he fumbled while being sacked by DE Jevon Kearse and Albert Haynesworth recovered at the Houston 32. Six plays later, Rob Bironas (pictured below) kicked a 26-yard field goal. The Texans responded by putting together a long, 16-play drive that covered 70 yards. Schaub connected with Johnson for 22 yards on a third-and-ten play and followed right up with another pass to Johnson that gained 14 yards. A roughing-the-passer penalty helped Houston out of a third-and-23 jam and Steve Slaton had a 19-yard run along the way. Finally, on the first play of the second quarter, Kris Brown kicked a 32-yard field goal to tie the score. The Titans went three-and-out on their next series, and after the ensuing punt had the Texans starting at their own 11, Schaub went long for Johnson down the middle for a 65-yard gain to the Tennessee 24. After three running plays, Schaub went to Johnson again and the result was a 13-yard touchdown. Brown added the extra point and Houston was ahead by 10-3. The teams traded punts before the Titans reached midfield and Collins threw to WR Justin McCareins for 17 yards, only to have the receiver fumble and DE Tim Bulman recover for the Texans at their 31. The clubs returned to exchanging punts until, with 39 seconds remaining in the half, the Titans took over the ball at their own two and quickly moved 93 yards in four plays. The biggest was a pass from Collins to WR Brandon Jones for 40 yards and that was followed by a 36-yard gain on a pass interference penalty. Bironas kicked a 23-yard field goal and the score was 10-6 at halftime. Following a short possession to start the third quarter, the Texans punted and Tennessee drove 30 yards in nine plays. Collins completed two passes, both to TE Bo Scaife, and RB LenDale White ran three times for 18 yards. Bironas kicked his third field goal, this time from 51 yards, and Houston’s lead was down to one point. That was the way it stayed for the remainder of the period. A long series by the Texans reached the Tennessee seven, but it was all for naught when Brown missed a 26-yard field goal attempt. As the game headed into the fourth quarter, the Titans had the ball deep in their own territory and had to punt. An apparent 23-yard return by WR Jacoby Jones was wiped out by an illegal block and the Texans had to start at their 36. But a pass interference penalty got them to midfield and back-to-back pass completions to TE Owen Daniels – the second of which was good for 19 yards in a third-and-five situation – got them to the Tennessee 12. Once again they tried for a field goal, and this time Brown was successful from 24 yards to give the home team a 13-9 lead. The Titans reached the Houston 48 on the next series and punted. The Texans had a short series that also resulted in a punt, with Matt Turk booming it 57 yards but DB Chris Carr returning it 17 yards to the Tennessee 39. Collins immediately went long and WR Justin Gage caught it for a 28-yard gain to the Houston 33. Chris Johnson ran for 13 yards but the drive finally stalled at the 16 and Bironas was once again called on to kick a field goal, which was successful from 34 yards. Schaub threw to Andre Johnson for 40 yards on a series that reached the Tennessee 41 and resulted in a punt. The Titans came right back with a big pass play of their own as Collins connected with Gage for 34 yards, but facing fourth-and-three at the Houston 32, Tennessee passed up a long field goal attempt and came up empty when Collins tossed an incomplete pass. That came with just under two minutes remaining to play, and proved to be Tennessee’s last shot. The Titans used all three of their timeouts on the next series, but a 12-yard carry by Slaton gave the Texans a game-clinching first down as they were able to run out the clock. Houston was the winner by a final score of 13-12. The Texans had the edge in total yards (375 to 281) and first downs (22 to 14). However, they hurt themselves with 11 penalties at a cost of 127 yards, as opposed to 7 flags thrown on Tennessee totaling 64 yards. Houston also gave up three sacks while not getting to Kerry Collins at all. The Titans turned the ball over twice, to one suffered by the Texans. Andre Johnson, who was largely shut down by the Titans when the two teams met earlier in the season, had a huge performance with 11 catches for 207 yards and the game’s only touchdown. Matt Schaub completed 23 of 39 passes for 284 yards and a touchdown with none intercepted. 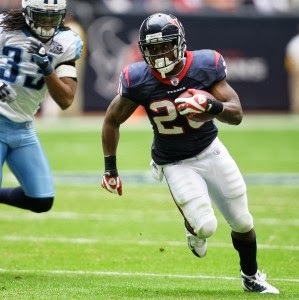 Steve Slaton (pictured below) ran for an even 100 yards on 24 carries. For the Titans, Kerry Collins was successful on 15 of 33 throws for 181 yards and no TDs with one intercepted. Chris Johnson rushed for 65 yards on 13 attempts. Justin Gage caught three passes for 76 yards. Rob Bironas was the scoring star as he was successful on all four of his field goal attempts – but one that he didn’t get to try on Tennessee’s last possession might have made the difference in the outcome. The Texans lost the next week but won their season finale to finish at 8-8 for the second straight year, again missing out on a winning record and placing third in the AFC South. They would finally finish over .500 for the first time in 2009. Tennessee split its last two games but ended up with the conference’s best record at 13-3. The season ended in disappointment with a loss to the Ravens in the Divisional round of the postseason. 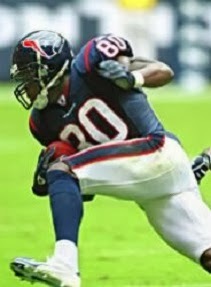 Andre Johnson, in his sixth year, led the NFL with 115 catches and 1575 receiving yards. He averaged 13.7 yards per catch and scored eight touchdowns. It all resulted in his receiving consensus first-team All-NFL recognition as well as selection to the Pro Bowl for the third time. His 207 receiving yards against the Titans set a franchise record that he broke in 2012.